“Angel, if anything happens to me, will you watch over ‘Liza-Lu for my sake?” she asked, when they had listened a long time to the wind among the pillars. She ceased, and he fell into thought. In the far north-east sky he could see between the pillars a level streak of light. The uniform concavity of black cloud was lifting bodily like the lid of a pot, letting in at the earth’s edge the coming day, against which the towering monoliths and trilithons began to be blackly defined. Translating this pivotal scene from Tess of the D’Urbervilles into a text message conversation included two challenges: changing the language into informal text language while also modernizing the scene, all while trying to convey the same meaning. Changing the language was simple enough. It included simplifying and deformalizing the words. I used text abbreviations for phrases like “by the way” and “I love you” to shorten sentences, making them easier to type and read. I took out most unnecessary punctuation, only including things like question marks, exclamation marks, and ellipses, which help to convey important contextual emotions that are limited in a text conversation. I shortened words like “would” and “people” by misspelling them and occasionally added extra letters to make it all flow more casually, in keeping with text lingo. I also sometimes added emojis for emphasis, which also help to convey important emotions and can totally change the way certain texts are read and understood. The second part of this remediation was modernizing the language and ideas. For example, Tess says that Liza-Lu is “growing up so beautiful.” I changed the word “beautiful” to “hot,” a more modern and casual way of conveying attractiveness. I also used abbreviations like “wtf” and “lol,” which would never have been said in the novel, to modernize the texts. I neglected a good amount of the more serious, religious imagery found in the novel, like the talk about spirits and death, because text conversations tend to have more light subjects. In translating a scene from a 19th century novel to 21st century text lingo, I realized how limiting the medium of texting is. It is far more difficult to convey context, because there is no narrator in a text conversation; there are only the characters participating. You can only convey what each character actually says, or types in this case, and are forced to neglect their thoughts or the outsider’s perspective of a narrator. In a text message, there is no one to say things like “she asked, when they had listened a long time to the wind among the pillars.” The only information conveyed about the environment of each character is what they say, in this case, not much. 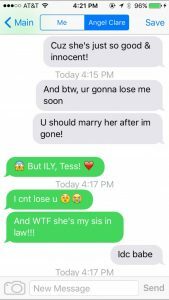 To convey a separation of thoughts and the rambling of Tess when she tells Angel why she wants him to marry her sister, I used several different message bubbles in comparison to the ellipses used in the novel. I also used an ellipsis at the end as well as some emojis to convey Angel’s lack of response to Tess’s long ramblings. Another dimension of this remediation is that in a text conversation, the characters don’t have to be, and usually aren’t, physically next to each other. I added in the greetings at the beginning to imply that in the text version, the two are not physically together; this is a significant change in context. Translating the scene into a text message conversation makes it a lot less intense and serious. 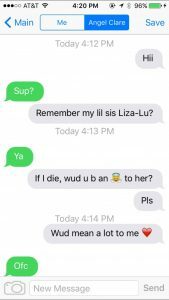 For example, my use of the angel emoji in the seemingly grave sentence when Tess implies her impending death makes the idea seem almost sarcastic, especially considering that his name is Angel. The addition of “lol” and “wtf” also make the whole scene seem sarcastic, in contrast to the scene in the novel, which has a far more serious tone. Overall, changing the novel into text messages did change important parts of the scene dramatically.